With approximately 400 million micro, small, and medium enterprises around the developing world, successful small businesses have the potential to improve the livelihoods of millions of families. However, many entrepreneurs lack the necessary skills to manage the complex finances of a small enterprise. Traditional classroom-based financial education courses have attempted to tackle this problem for many years. However, despite their global popularity, these trainings have had almost no impact on actual financial behaviors and are expensive to scale. Why? Behavioral science tells us that increased knowledge does not always translate into action, and the hassles associated with attending an in-person training for an entrepreneur (scheduling, transport, time away from managing the business) tend to suppress turnout. With this in mind, we developed a scalable mobile-based training program that simplifies financial management lessons into easy-to-adopt rules of thumb and delivers them at the clients’ convenience. The Financial Heuristics Training has been tested and proven effective in three regions around the world. The results are striking. 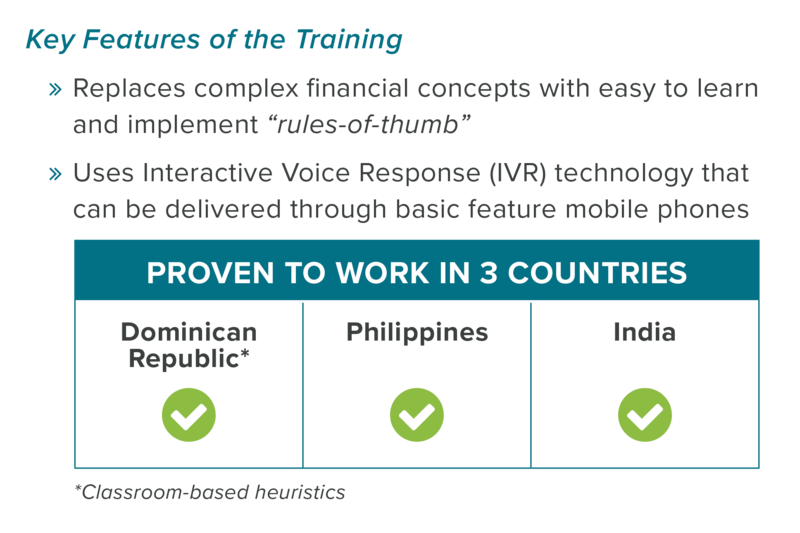 In India and the Philippines, listening to our IVR messages via mobile phone improved key financial management practices by between 2 and 8 percent among training participants, compared to the group that received no training. Participants were highly engaged with the messages – on average, across both countries, 76% of clients picked up the training calls and listened to at least 70% of the message. Furthermore, delivering the Financial Heuristics via mobile phone was cheaper, particularly in India, where it cost about 67% less than the institution’s in-person financial education training. Randomized controlled trails were conducted in collaboration with Janalakshmi, Institute for Financial Management and Research (IFMR Lead), Negros Women for Tomorrow Foundation (NWTF) and Innovations for Poverty Action (IPA). Heuristics are essentially “Rules of Thumb” which serve as shortcut decision-making aids that enable people to make reasonably good decisions without needing to account for all of the complex nuances of a particular situation. Every day, and in many different ways, we are called upon to make many (sometimes very complicated) decisions. These decisions often require us to acquire, process, and act on a great deal of information. Heuristics are commonly used to simplify decisions in manageable sets of choices. For example, to make rice, if you follow a recipe that says “for every 100 grams of rice, use 7.054 ounces of water” you might get stuck trying to find different measuring devices. Alternatively, you could use the heuristic “one part rice, two parts water” and use whatever vessel available to you. In this way, heuristics can help individuals turn an intention to do something into a realized action, when in the absence of a simplifying mechanism, an individual might not act at all. The need for heuristics is especially apparent for microentrepreneurs in developing countries, who work in fast-paced environments, and are called upon to make numerous quick decisions throughout their day. In family owned businesses, these decisions become yet more complex as entrepreneurs must balance the needs of their businesses with those of their households. In this regard and others, microentrepreneurs often lack necessary skills to ensure that their businesses succeed and grow. Though many trainings exist to help these populations learn important skills like cashflow management, they often add to, rather than reduce, complexity and have therefore failed to help recipients translate knowledge into action. 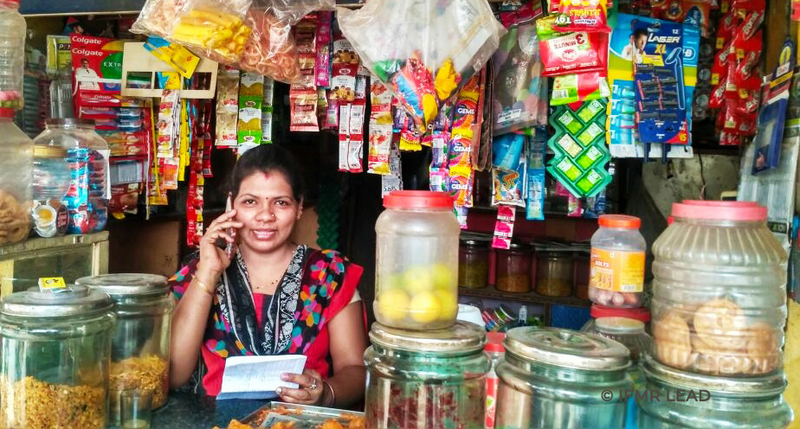 Combining scientific insights about human behavior and months of interviews with microfinance lending clients, the ideas42 team distilled complex business concepts and decisions into easy-to-implement action steps, called “Financial Heuristics”. For example, one financial heuristic teaches entrepreneurs to physically separate the money for their business and household by placing cash in two separate locations as they receive it. Using rules of thumb like this, microentrepreneurs are given an easy tool to help them budget resources for each purpose. In this way, Financial Heuristics help microentrepreneurs make “reasonably good” financial management decisions without needing to understand all of the complex nuances of accounting or business planning. What are the differences between traditional financial literacy trainings and ideas42’s Financial Heuristics Training? Traditional financial education programs treat the microentrepreneur skill-gap as a lack of knowledge problem best solved by intensive technical classroom-based training sessions. These types of trainings are not designed with human limitations in mind, may not be held at ideal times or in ideal environments for learning, and often rely on recipients to translate abstract academic concepts into applications to their day-to-day businesses. Implicit in these programs is an assumption that with the right training in concepts such as accounting and business planning, people will begin to make perfect business decisions. Despite their popularity, recent global analysis of these types of trainings have refuted this assumption, showing little to no impact of such programs on changing microentrepreneurs’ actual behaviors. Simplifies complex financial concepts into easy to learn and apply “rules of thumb” – bridging the gap between knowledge and action. Leverages mobile-phone based Interactive Voice Response (IVR) technology to deliver the training in the form of short audio messages that can be accessed by individuals of all literacy levels. Allows trainees to listen to course material at their convenience, providing the flexibility required for them to engage with material at times, and in locations, that are conducive to their learning. Why get Financial Heuristics Training for your community? ideas42’s Financial Heuristics Training is the only training that has been rigorously proven to work across multiple regions. Both the content and training delivery mechanisms were designed to be scalable and cost-effective for Financial Service Providers (FSPs). Large-scale evaluations over the last decade have found that the training effectively bridges the gap between knowledge and action in India, the Philippines, and the Dominican Republic in ways unseen by other trainings. The key benefits are listed below. I am based in a country other than the Dominican Republic, India, or the Philippines. Can this training be used for microentrepreneurs in my country? Yes. Using our powerful “behavioral mapping’ methodology and leveraging our over 10 years of experience working with microentrepreneurs globally, the ideas42 team was able to identify relatively universal financial management challenges faced by microentrepreneurs. The Financial Heuristics Training was therefore created to overcome these common challenges, and was applied in three disparate contexts: the Dominican Republic, India, and the Philippines. After rigorously evaluating the efficacy of the training in each country, we were thrilled to find significant improvements in the business practices of training recipients in all three settings, despite the numerous differences between each populations. As a result, we consider the Finanical Heuristics Training to be replicable across countries where microentrepreneurs face these common financial management challenges. That said, a major strength of the training lies in delivering the content to recipients in ways that are engaging and relatable. As a result, at the outset of each new partnership, the ideas42 team works with FSPs to tailor the narrative of the training to their clients’ contexts by identifying locally relevant anecdotes and examples to illustrate the core content. At Negros Women for Tomorrow Foundation (NWTF), we [previously delivered] our financial literacy course to our clients in a classroom-based training. Participants have to travel all the way from their homes or businesses to attend. They have to close their business if there is no one trusted to take care of it while they are away. As a result, they have no income for the day, and they have to pay for their own transportation to get to the training. This makes high attendance very challenging. When we implemented the ideas42 Financial Heuristic Training through a different delivery channel – the mobile phone, there were significant changes in the behavior of our clients. When we interviewed some of our clients, they said that the messages they received were easy to understand, useful, and easy to adopt. The ideas42 team communicated with us through personal visits, emails, and Skype to make sure that the NWTF Staff would have a comprehensive understanding about the Training prior to its implementation. It was a good learning experience, and we’re planning to scale the training in 2018.
to help their clients succeed!